Members of the Disability Persons Organisations (DPOs) are benefiting from a unique partnership that is providing them with a workshop and high-quality electric tools for carving production and training. People with disabilities have developed many new skills in wood, pearl and bone carving through training with Tonga Skills, and are able to create new products to sell. However, there was a problem – they did not have any of the expensive tools needed to continue their work and improve their incomes, or a workshop to use. Altus Trust, a New Zealand organisation who already provides services to Mango Tree in Tonga, generously offered to send high quality tools including a drill press, Dremel sets, bench grinders, polishers, buffers and safety equipment for the exclusive use of people with disabilities. Providing a secure workspace for the tools and this activity has been achieved through the vision of Brother Cruz Mesias, Principal of Montfort Technical Institute (MTI). MTI sees this as a way to support people with disabilities, and to provide a pathway to trade courses, which Tonga Skills is also enabling. Brother Cruz has donated the use of a new wheelchair-friendly building as a workshop for the setup of the equipment, and their exclusive use by members of the DPOs. At a recent ceremony at MTI the tools were officially handed over on behalf of Altus Trust by Ms Katrina Ma’u from the New Zealand High Commission. 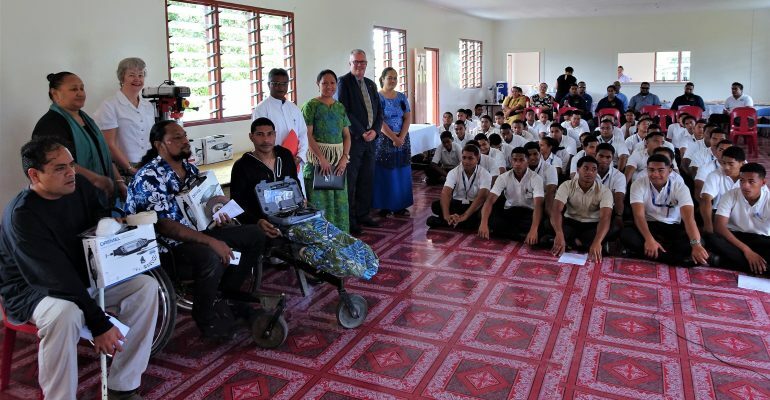 The Australian High Commissioner to Tonga, His Excellency Mr Andrew Ford, said that both governments are committed to increasing the visibility, income and skills of people with disabilities.